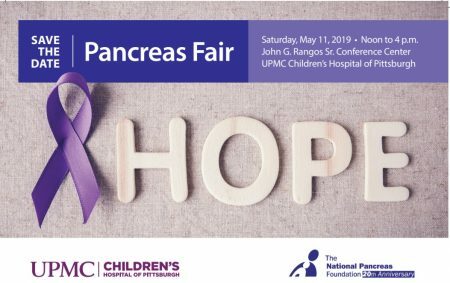 and the National Pancreas Foundation are proud to host a (free) Pancreas Fair for patients, families, and caregivers! On Saturday, May 11, 2019 (noon – 4pm) join us at the John G. Rangos Sr. Conference Center at UPMC Children’s Hospital of Pittsburgh. 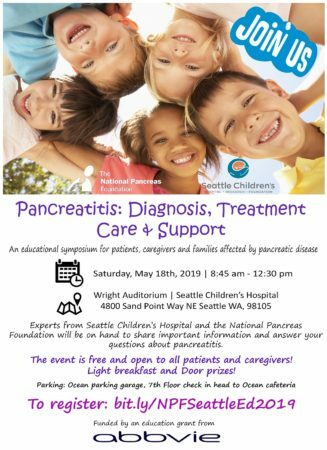 The National Pancreas Foundation and the Seattle Children’s Hospital Division of Gastroenterology & Hepatology presents a patient-centered educational event. The main goals are to increase understanding of the immediate and long-term impact of pancreatitis on health, ability to function; to discuss the approach to getting your voice heard; approaches through mindfulness as method of pain relief and helping you understand if a total pancreatectomy is right for you. We will also discuss updates and resources available at the National Pancreas Foundation national office, the local chapter and the approved centers in the State of Washington. Experts from Seattle Children’s Hospital and the NPF will be on hand to share important information and answer your questions about pancreatitis. The event is free and open to all patients and caregivers with a light breakfast and Door prizes. Please join us for an afternoon of fun, noshing on appetizers and trivia. We will gather to remember Rob Ericson and raise money for researching a cure for pancreatic disease – pancreatic cancer and pancreatitis (the disease that took Rob’s life). Ask your friends, family members and neighbors to attend with you. Let’s grow this event! If each of you invites one person and they attend, we have doubled our attendance. If pancreatic disease is the storm, then we are the warriors that are fighting that storm. Your donation means you are helping to fight the storm Rob can no longer fight! 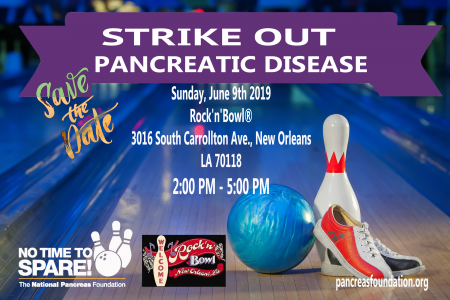 Join the National Pancreas Foundation Louisiana Chapter on Sunday, June 9, 2019 at the historic Rock’n Bowl for an afternoon of bowling and family fun! Your registration includes bowling for two and a half hours, bowling shoes, food and soft drinks. We will also have a band performing at the event with a silent auction to follow. We look forward to seeing you on June 9th. 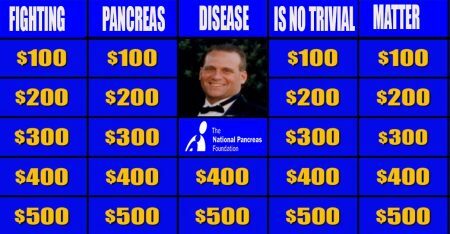 If you have any questions, please contact Chapter Chair, Jane Macke at Louisana@pancreasfoundation.org. 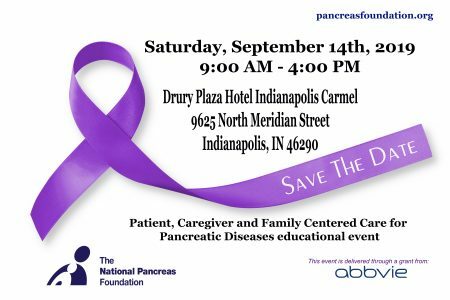 The National Pancreas Foundation Indiana State Chapter presents a Patient and Family Education event focusing on “Chronic Pancreatitis” covering Pain Management, Nutrition, Behavioral Medicine, and More. The University of Michigan and the National Pancreas Foundation Michigan Chapter will jointly host a third Patient and Family Centered Care for Pancreatic Diseases educational event. The main goals are to increase understanding of the immediate and long-term impact of pancreatitis on health, ability to function and work and medical coverage; to discuss the approach to complex care and to highlight causes and the approaches to chronic pain. We will also discuss updates and resources available at the National Pancreas Foundation (NPF) National Office, the NPF Michigan Chapter and the University of Michigan NPF center of excellence. The event is free and open to all physicians, patients and caregivers. All attendants need to sign up by September 15, 2019. To register, please CLICK HERE. For further inquiries please send an email to Robin Winke at the National Pancreas Foundation Michigan Chapter: michigan@pancreasfoundation.org. 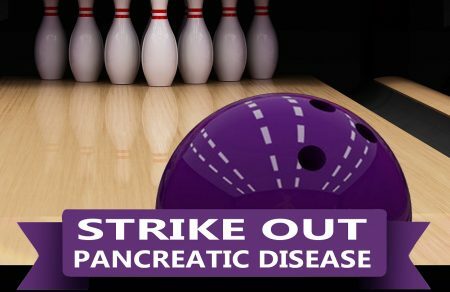 Strike Out Pancreatic Disease – Indiana @ Three, Two, Fun!